I am a member of the Collective Bias® Social Fabric® Community. This sponsored shop has been as part of a social shopper insights study for Collective Bias and their client. You know how I feel about easy recipes and meal planning. Having a plan in place is the key to getting dinner on the table each night- especially on busy weeknights. One way to help dinner come together quickly is to cook fish- like tilapia. 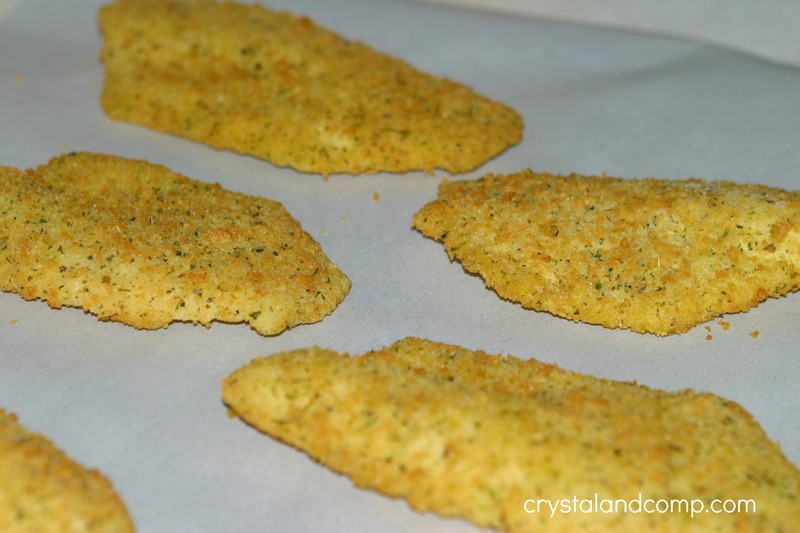 I love these precooked Parmesan encrusted fillets. All we have to do is heat them up in the oven. This is perfect when you want to get dinner on the table in 30 minutes or less. Start your water boiling for the spaghetti noodles. Meanwhile, grab the fillets. Use a cookie sheet lined in parchment paper to make cleanup a breeze. Place the fillets on the sheet and pop them in the oven for about 20 minutes, or until headed thoroughly. In a skillet, get the olive oil going in a skillet over medium heat. Toss in the garlic. Let it cook for a minute. 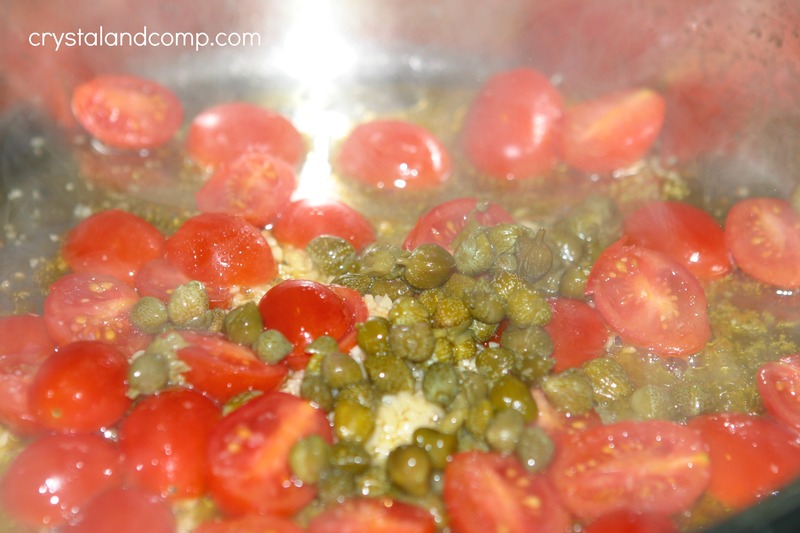 Add the capers and cherry tomatoes. Add a pinch or two of salt over the mixture, focusing mostly on the cherry tomatoes. Pour in the can of tomato sauce. Once well combine let it cook for about 2-3 minutes and then move it to simmer. 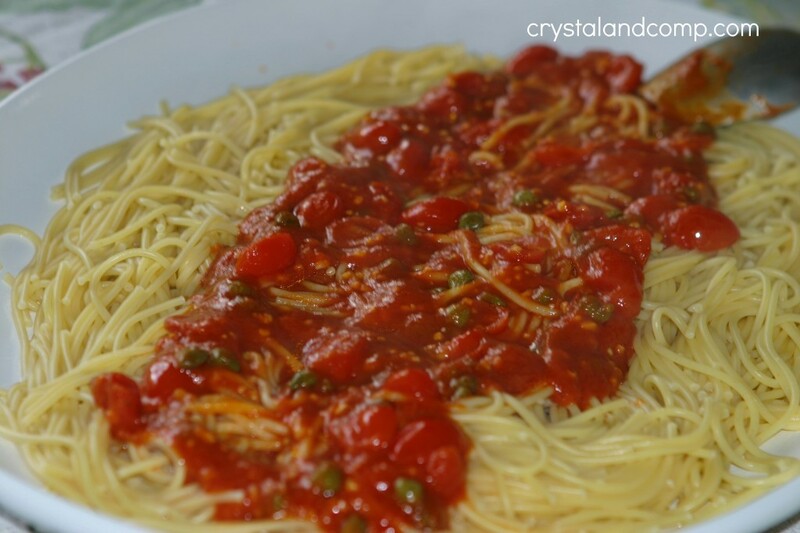 While the sauce is simmering, the water for the spaghetti should be boiling. Boil them for 9 minutes. 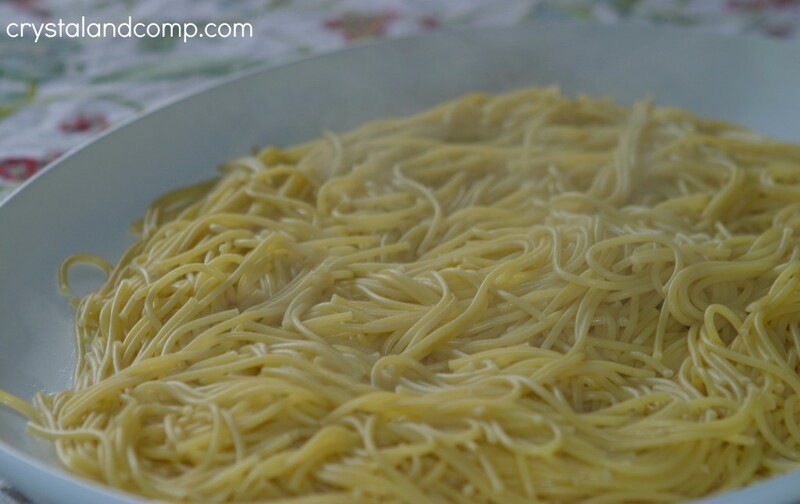 Once the noodles are done, drain them and pour them evenly onto a platter. 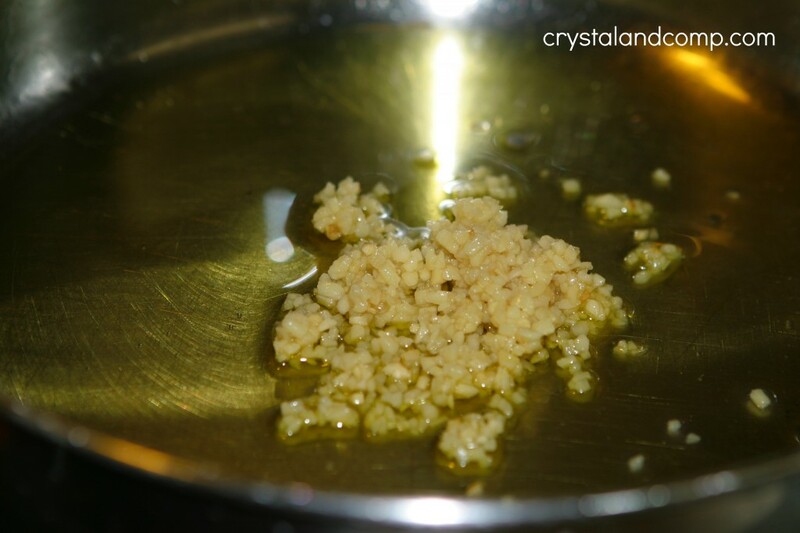 Now your sauce should be perfectly simmered. Evenly pour it down the center of the pasta. Now your fillets will be done in the oven. 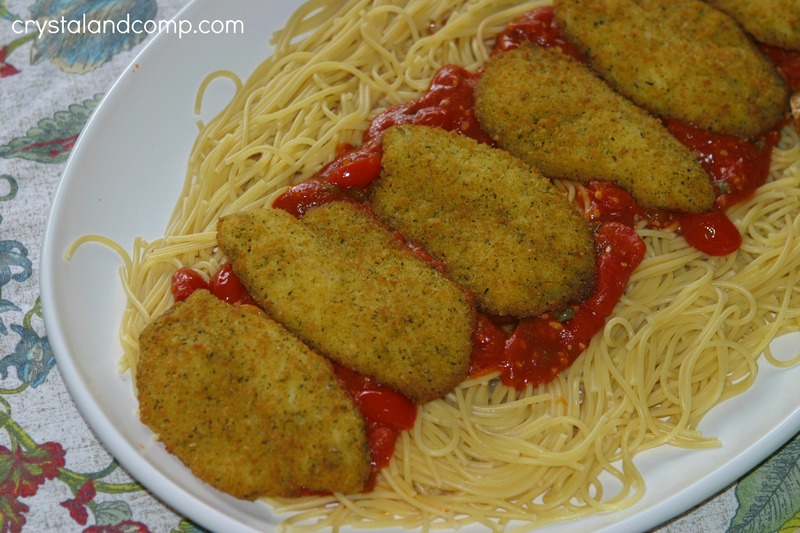 Remove them from the cookie sheet and place them over the sauce and noodles. 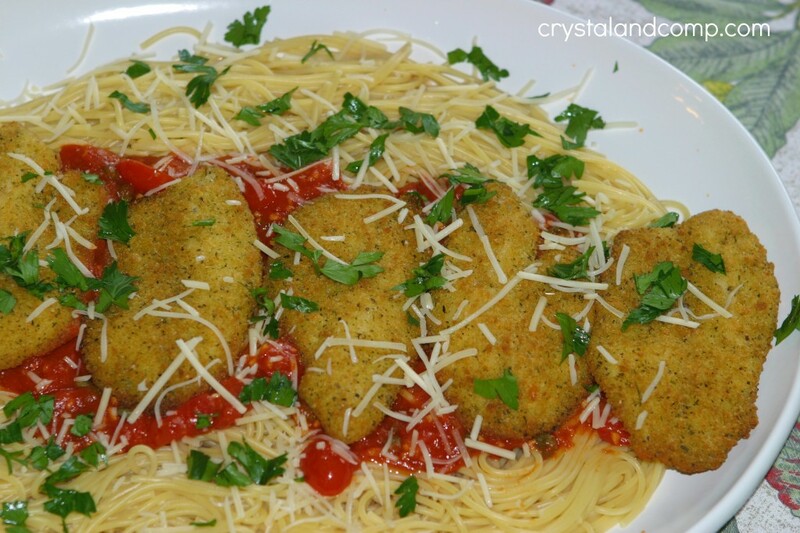 Top with some freshly grated Parmesan and chopped parsley. And this is one gorgeous dish! It looks like you cooked it all day long. 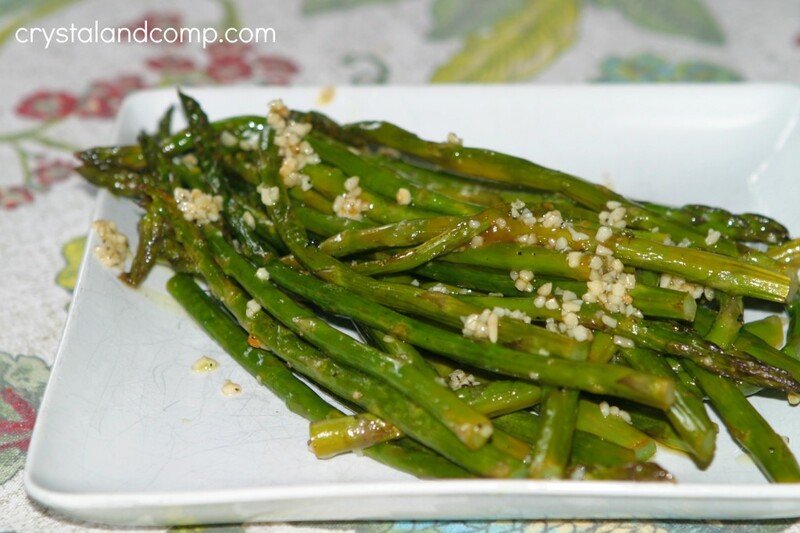 I had a second cookie sheet going in the oven with garlic butter asparagus. It was done with everything else was done. And I made these yummy biscuits. So good! Dinner is served. It was absolutely delicious. The perfect Sunday meal. I love how light the sauce was over the pasta. We had leftovers for lunch today and they were just as tasty! I love how easy this meal was to pull together. Everything was done in 30 minutes. Perfect for busy families. And the best part? Clean up was easy! What is one of your favorite ways to make dinner easy for a busy weeknight? Check out my G+ story for more shopping pictures! This easy dinner idea is perfect for busy families. This fish and pasta entree is done in 30 minutes or less and tastes like you've been cooking it all day! Meanwhile, grab the fillets. Use a cookie sheet lined in parchment paper to make cleanup a breeze. Place the fillets on the sheet and pop them in the oven for about 20 minutes, or until headed thoroughly. In a skillet, get the olive oil going in a skillet over medium heat. Toss in the garlic. Let it cook for a minute. Add the noodles to the water. Boil them for 9 minutes. 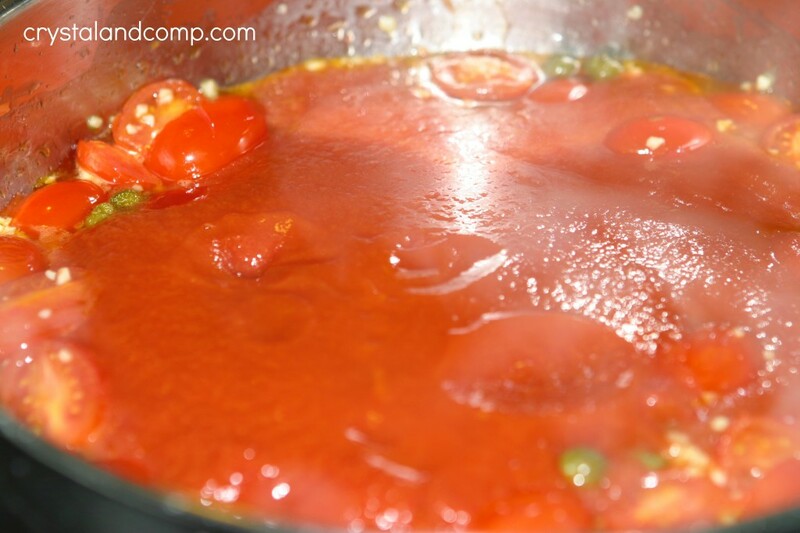 Now your sauce should be perfectly simmered. Evenly pour it down the center of the pasta. Now your fillets will be done in the oven. Remove them from the cookie sheet and place them over the sauce and noodles. 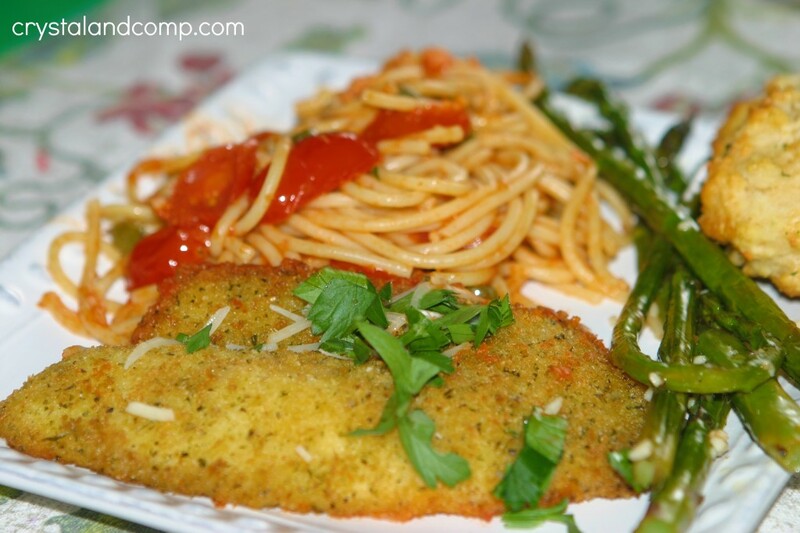 My family loves the parmesan encrusted tilapia. It’s a new favorite in my house!! I love that it’s easy, too! Totally a new favorite here too. We will certainly be buying it again. So delish! 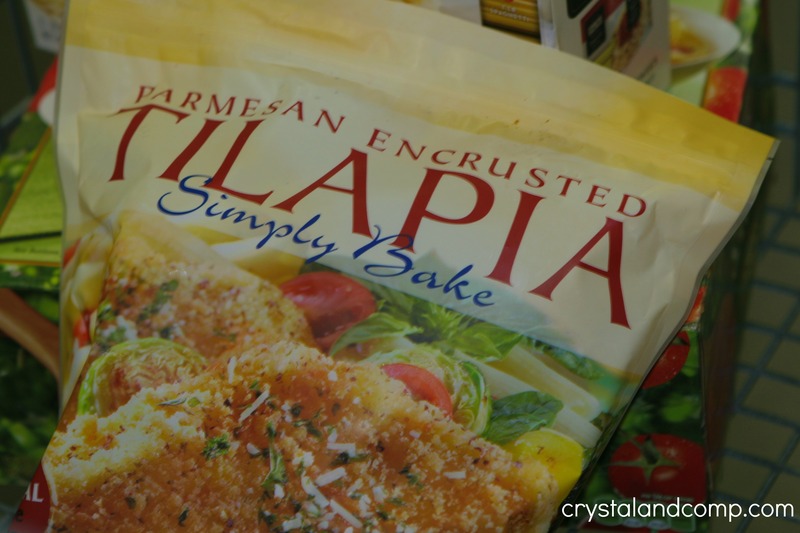 I love Tilapia, but I’m always afraid to cook it myself. This looks so easy, I need to give it a try! Arena- this is totally a safe way to go. Essentially, you’re just heating up the fish and warming it through until it is golden brown. Thank you Betsy. It really is so easy and comes together quickly! This looks great Crystal! And the biscuits look good, too..love me some biscuits. I love biscuits at dinner. 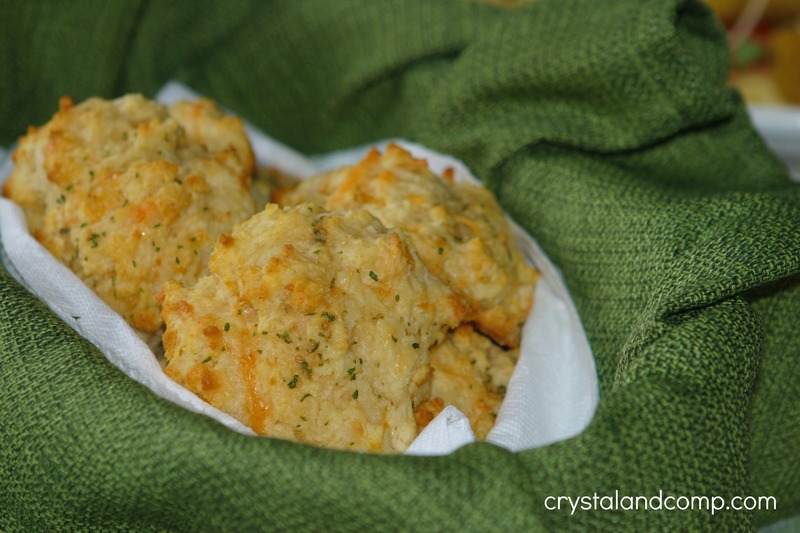 Those are the Red Lobster garlic herb biscuits and you can get the mix at Sams too. This looks super yummy! 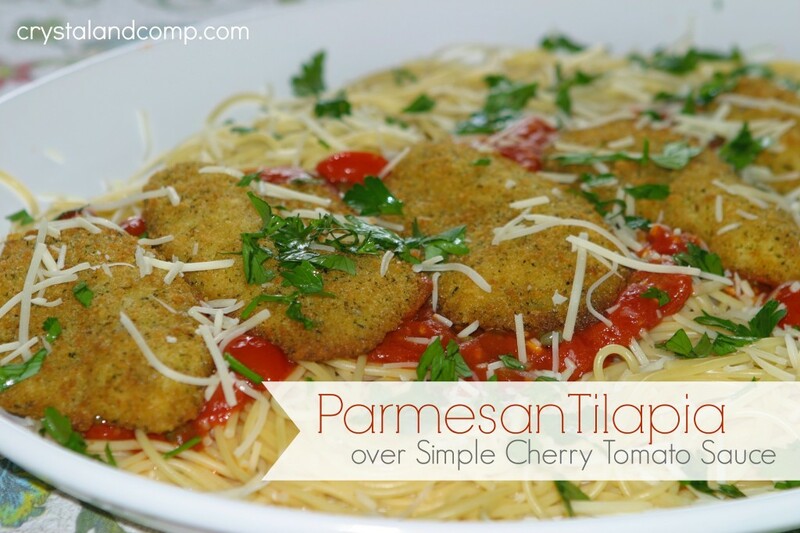 I have a ton of tilapia in freezer right now, so I think I might have to try this out! Thanks for sharing! It is so delicious and so easy. I think you’ll really like it. Yummy!!! =) Thanks for sharing this at the Pinterest Power Party!! Looks so easy and great! This looks like a very delicious dinner, a beautiful presentation. Have a great weekend and thank you so much for sharing with Full Plate Thursday. Oh, it is so good. Such a great solution for making dinner prep and cook time easy!